Following on from my blog post titled Five second marketing; Ideas for a distracted world and Nicholas Carr; What the internet is doing to our brains I have found some wonderful writing that supports that view in both style and content. I am currently 20% through the book (according to my Kindle) and for once I actually wanted my South West Trains service to London Waterloo to slow down this morning so I could read more! 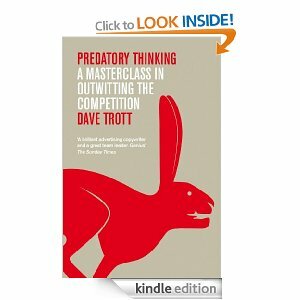 Predatory Thinking is a series of short stories written by Dave Trott which is often written in short sentences, which really helps us digital natives focus. I love the quote “If you weld a JCB to a Ferrari you don’t get a machine that can dig roads at 200 mph. You get something that can do neither job very well” A quote used when Trott describes how advertising should have only one strong message per campaign. The title of part three should also make marketers sit up and take notice as well. ‘90% of advertising doesn’t work’ is a great story that demonstrates just how hard advertising has to work just to be seen in the first place. I really believe this, especially in the digital space when there are so many different stimuli trying to attract a consumers attention. As I said in Five second marketing; Ideas for a distracted world brands should say just one thing, say it quickly and say it often in order to stand a chance of cutting through the clutter and being noticed. Mobile in particular sees consumers interact hundreds of time s day for a very short period each time, so your chance of connecting relies on brevity, standout and clarity of message. Next Where are all the five second video adverts?